I was trying to assist on a project in the office today (using Revit® 2018.3), when I ran into this issue, documented by Dave Baldacchino nearly six years ago. I set up a simplified set of files for experimental purposes; the images below demonstrate the problem remains an issue at least through 2018.3. I created a "link" model, that has one Design Option Set (Exterior Walls) which in turn has two Design Options, Option 1 (primary) and Option 2. Each Design Option has one Wall object, running in the Project North-South direction (up and down on the screen). 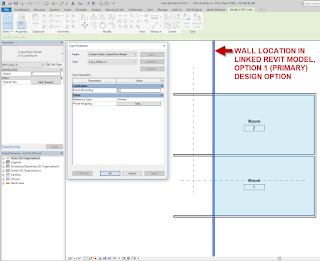 These are identical, with the exception that the Wall in Option 2 is offset 10 feet in the direction of Project West (left on the screen). The link model is linked into a "host" model (origin to origin; both files were started with the same template file). In a floor plan view, four additional Walls were drawn, and two Rooms with Room Tags added. In the image below, the link model is showing Option 1 (primary). 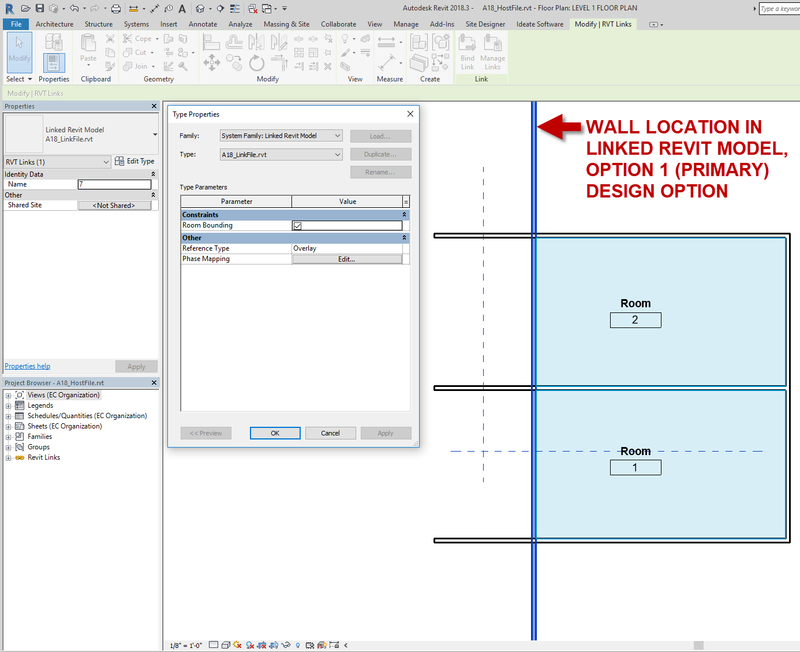 The link model is selected, and its type properties displayed to show that the link model is set to be room bounding. Interior Fill is turned on for the Rooms, to illustrate their extents. No surprises there. 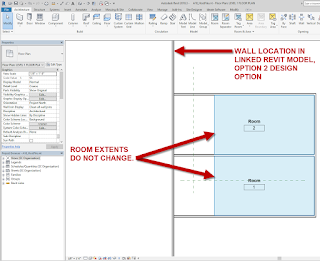 But change the Visibility Graphics Overrides for the linked model to display Option 2, and the Wall moves 10'-0" to the left, as expected, but the Rooms stubbornly maintain their extents at the face of the Option 1 (primary) Wall location. 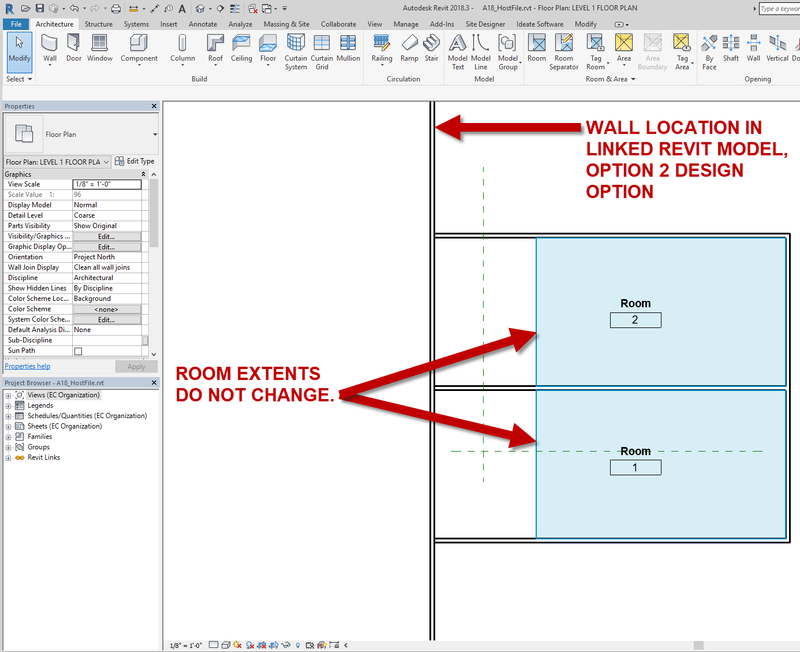 The workaround, to make the linked file not be room bounding, and to draw Room Separation lines in the host file, is not going to make anyone on that project team very happy.